An Exposition of the Attempts of the Quṭbiyyah, Takfiriyah, Ḥaddādiyyah [and Ḥajāwirah] to Ascribe Irjāʾ to Shaykh Rabiʿ. A refutation and clarification of the attempts of some of the Hajurites to follow the ways of the Haddaadi takfiris in ascribing Irjaa to Ahl al-Sunnah. PDF File. In the above PDF reference was made in places about some of the Hajurites (in Netherlands) who have begun to show sympathies towards ISIS (see here) and they also have clear connections with the new Criminal Haddaadi takfiri faction that has emerged, such as Abdul-Hameed al-Juhani, Abdullah al-Ghamidi, Abdullah al-Jarboo' and others. In the image shown, we see one of these Haddadi Hajurites from the Netherlands - [in whose heart there is not even an ounce of concern for defending Uthmaan (radiyallaahu anhu) from the slander of bid'ah, mukhaalafah and dalaalah ascribed to his action- but he is happy to defame, slander and speak ill of those who defend the honour of Uthmaan (radiyallaahu anhu)] - we see him supporting and showing his connection to a Haddaadi criminal by the name of Abdul-Hameed al-Juhanee. And no one says that the one who abandons it (the prayer) is not a kāfir except one who has been affected by the (thought of) al-Irjāʾ, whether he realises it or not.!! If you remain looking at the difference regarding the ruling of the one who abandons prayer as an acceptable, considered difference (of opinion) and that the statement of affirming Islām for the one who abandons prayer is an acceptable, considered Salafi viewpoint, then you have revived Irjāʾ. According to this Haddaadi the vast majority of the Ummah has been guilty of reviving al-Irjaa' - from those who hold the view of abandonment of prayer not being major kufr and from those who assert it is a difference of opinion that has existed from the time of the Salaf - this includes all the major Scholars of Ahl al-Sunnah, throughout the centuries until we reach Ibn Taymiyyah, Ibn al-Qayyim, then Muhammad Ibn Abd al-Wahhaab, all the way through to our times, al-Albani, Ibn Baz, Ibn al-Uthaymin, al-Ghudayan, al-Najmee, Rabee', the Muftee, al-Fawzaan. No one is spared from the criminal judgement of this criminal Haddaadi who repeats the speech of those Murji'ah (al-Hawali, Awdah) to whom the likes of Sayyid Qutb, the reviler of the Companions (making Takfir of some of them in fact), promulgator of almost every major bid'ah in his books, from Tajahhum, Ittihaad, Jabar and so on, is a "shaheed" and "imaam of guidance" - he has followed in their way in making this criminal judgement in relation to the abandonment of prayer and judging the majority of the Ummah's scholarship as having revived Irjaa! And this is because Shaykh Rabee' (like many of the Scholars past and present) grants the excuse of ignorance to the common folk from those who fall into major Shirk. Until even Shaykh al-Fawzaan, has statements in which he grants the excuse of ignorance for the common Rafidah and declares them misguided but not disbelievers. And if he had been a Muslim, following the religion of Islām, and says, 'I testify that none has the right to be worshipped but Allaah and Muhammad is the Messenger of Allaah' and establishes the prayer, gives zakāh but brings major Shirk, not knowing it is major Shirk, then we treat him as a Muslim, we wash him, shroud him, pray over him and bury him with us so long as the proof has not been established upon him. This according to al-Jarbu' and his extremist followers is the Irjaa' of Jahm bin Safwaan! So this is Abdul-Hameed al-Juhanee. Ash-shaykh Abu Maalik was a known salafi shaykh with tazkiyaat by numerous ulema before this discussion. Who's the Haddaadi now? 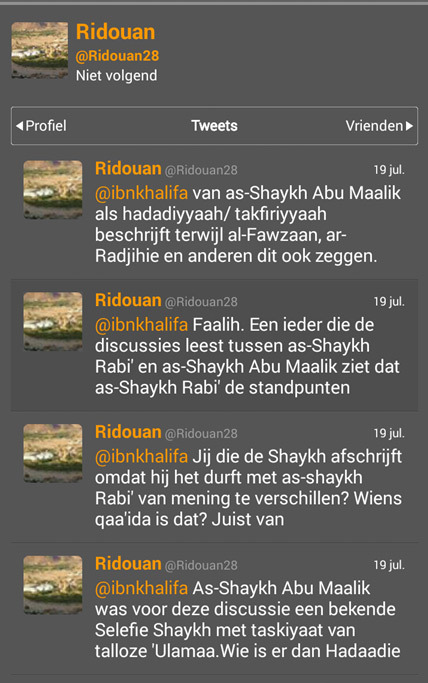 ... of Shaykh Abu Maalik as Hadadiyyah/Takfiriyyah while al-Fawzaan, ar-Raajihi and others say the same. It is clear that these Haddaadi Hajurites, because they chose blindness over guidance in the issue of Uthmaan (radiyallaahu anhu) and his adhaan, and chose ta'assub to al-Hajuri over tajarrud for the truth, they are being led further down the path of misguidance through their attachment to this criminal Haddaadi and those like him such as al-Jarbu' and al-Ghamidi - all because of their resentment and hatred for Shaykh Rabee and out of seeking vengeance for the sake of Yahya al-Hajuri. Abdul Hameed al-Juhanee used to be Salafi but then chose blindness over guidance when he entered the burrows of the Haddaadiyyah. He has many recorded tapes and writings in defence of Imaam al-Albani from the accusation of Irjaa' and in defence of Shaykh Rabee' against the Haddadis takfiris and their likes. And then he was misguided... So his tazkiyahs are invalidated, and true misguidance it is when you reject what you once knew as said by Hudhayfah bin al-Yaman (radiyallaahu anhu). Do al-Fawzan, al-Rajihee and others claim that saying "The view of abandoning the prayer not being major kufr is a legitimate Salafi opinion (let alone actually holding the view)" is a revival of Irjaa?! And is al-Juhanee speaking the truth? And is anyone who makes the likes of this baatil statement considered to be a person of knowledge from whom knowledge is taken? If this Haddadi (Riduoan) does not speak a word of truth on this matter and clearly take a position, then it is known he is a person of desires, blinded by bigotry and ta'assub, unable to recognize the truth when it is staring at him in front of his face, and someone who wilfully chooses baatil. In fact it is not surprising. For when a man persists in accusing Uthmaan (radiyallaahu anhu) of bid'ah, mukhaalafah and dalaalah in his action of instituting the adhaan, then you can't really have any greater expectations in lesser matters such as this innovated statement of al-Juhanee (regarding abandonment of prayer) which judges the vast majority of the Ummah with reviving Irjaa' and which he took from the misguided Qutbi Kharijite, Safar al-Hawali! Look at where the extreme hatred of these Hajurites is clearly leading them towards. They have already started using the doubts of these evil Haddaadis who are only out to create turmoil amongst Ahl al-Sunnah and splits between the Scholars through certain strategically chosen subject areas, and it won't be long before factions of the Hajurites enter the same burrow of al-Juhanee and company - clear signs are already apparent. This is because on the Oloom website you will see many years of defence of Shaykh Rabee' against the lies of Falih al-Harbee and Fawzee al-Bahrayni in relation to these subjects. And now, due the fitnah of this takfiri Haddaadi faction, they are using it only as a means of seek revenge against Shaykh Rabee for the sake of Yahya al-Hajuri - so just like al-Juhanee, we see from them rejection of what they once knew, and affirming what they once rejected.